Finally charged the digi-cam and had some time to snap some shots of what I'm working on now with this. Been working on this on and off for over a year (since I finished up my first version of this custom). I went back and re-did some things, starting with ball jointed and articulated Master Grade Gundam hands, I built up the neck using a small round plastic coke bottle cap connector (that piece that you have to twist the cap away from)--I cut it down to the size I needed, glued it down, cut and added small sheets of styrene, added a ball joint for the neck, and finally filled in the hole/gap with Pro-Create putty. 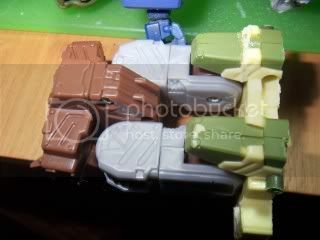 I opened up the Energon Megs head and hollowed out a small area to fit the female ball joint connector inside and glued it down, then screwed it back together. I thought I was just about done, but the more I sat and thought about it, the more I wanted to add even more articulation, which is something I don't think anyone else has done to this mold. 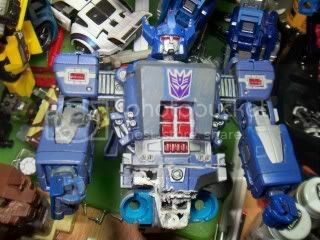 I removed the legs and cut off the old knee connector and started cutting away at the waist section of the Energon Megs mold. 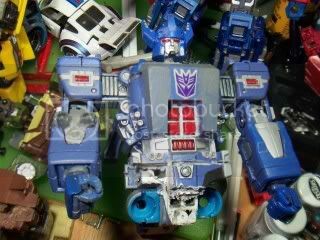 I then took a junker Universe Dropshot (ripped the arms off for my Shockwave WIP that I started on last December or so) and unscrewed the waist, keeping the internal stuff intact, and cutting between the waist and chest. Then I just above the Dropshot knees, keeping the knee joints in place and working. Now the knees can bend and twist to the left or right if needed (for better poses) and the waist still pivots left and right, which adds a lot of extra movement to the kinda brickish Energon Megatron figure. This is still in the WIP stages and the knees will be cut down to fit better on the Energon Megatron legs and I hope to finish cutting off the waist section and attaching the new sometime soon. In the end, I plan to repaint and detail this better than I did the first go 'round. If you see the different shades of purple and blue on this, that's my experiment to see which shade I want to go with (more than likely, I'm going with the shade on his head for the overall paint job). Also, none of this should affect the transformation--it should still be basically the same as my original, but with much better mods and articulation. I believe this does make in just bit taller than he once was, but it still works......hopefully. 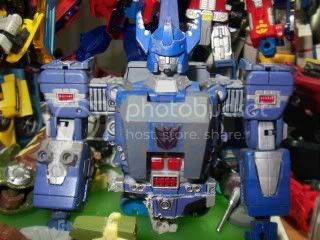 lol I'm using a few images from the reference libraries to help me along with this--Alex Milne Galvatron art with Cyclonus and Scourge and Marcelo Matere Galvatron art with Cyclonus and Scourge in the background. This won't look exactly like those, but they're providing some inspiration on this. 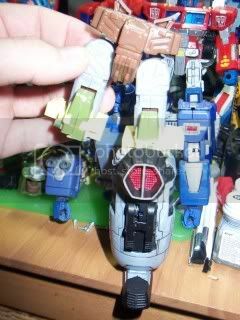 Love you knee idea (and Dropshot seems destined for salvage parts! ), and the coke bottle cap extra bit! I'd love to see close up pics of your neck work. The blue in question is nice. Personnally I prefer more purple for the show look, but the blue is still beautiful and more movie-ish. Can we get more pics? Also you might wanna use paragraphs to make it easier to read. And your sig pic almost brought tears to my eyes.